Marc Jacobs perfumes are some of my favorites, and I think the reason I like them so much - apart from the fact that they smell pretty darn good - is that that they come in super-adorable packaging. I own two Marc Jacobs perfumes - Oh, Lola! 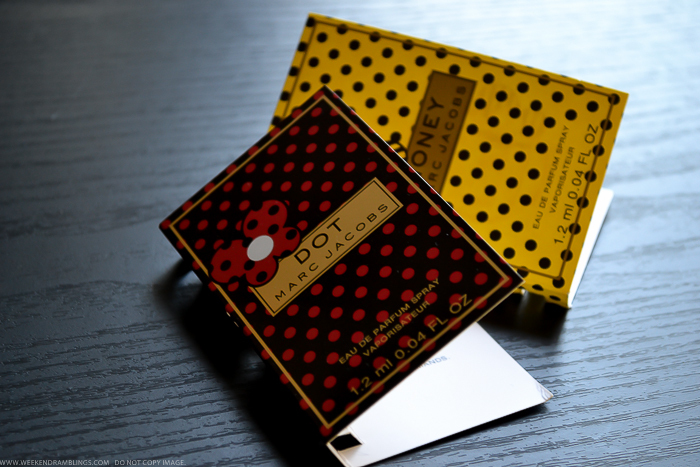 and Daisy - and some day, when I have a lot of space to properly store everything I would probably buy all the rest of them too :D For today, here's a review of two lovely fragrances from Marc Jacobs - Dot and Honey. 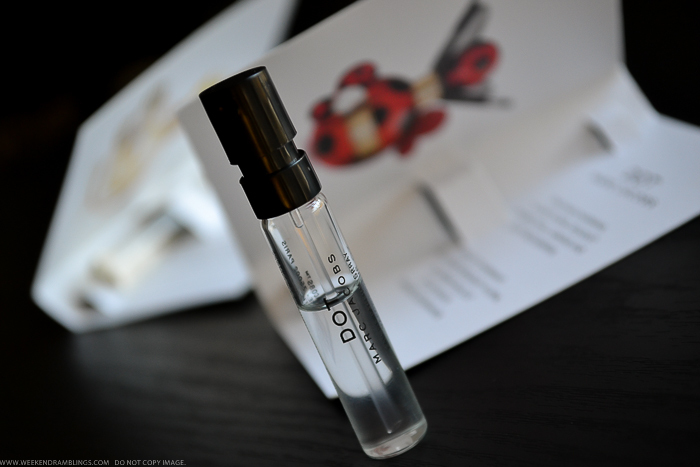 Marc Jacobs Dot is a playful fruity floral fragrance. It has the playful fresh sweetness of red berries, dragonfruit, and honeysuckle mixed with floral notes of jasmine and orange blossom. Coconut water adds a clean, simplicity to the fragrance, keeping it light and sophisticated. Yet, it is also quite longlasting on my skin. The bottle (orginal, not this sampler vial) is inspired by butterflies but the red and black dots just remind of ladybirds and spring. It truly does capture the happy, upbeat sunny days of spring perfectly. Fragrance Notes: Red Berries, Dragonfruit, Honeysuckle, Jasmine, Coconut Water, Orange Blossom, Vanilla, Driftwood, Musk. 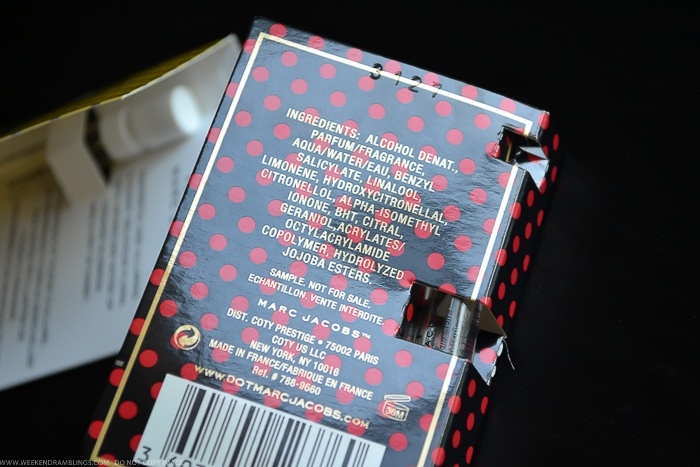 Marc Jacobs Honey is a newer launch from the brand. 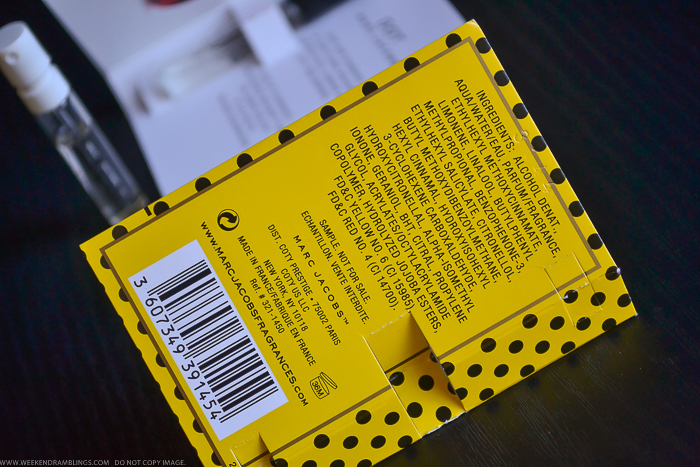 It's described as a sunny fragrance, and the cheerful yellow bumble bee like bottle sure does convey that perfectly. I find this a sweeter fragrance. While the official notes list peaches, apricots, and orange blossom, I find this a slightly heavier floral (compared to the other Marc Jacobs fragrances I have tried). Not that I dislike it, but the honey, vanilla and floral mix is just not rounded enough for me. I keep this for cooler winter days, and I still haven't made up mind on whether I would ever buy a full-size bottle of this one. Fragrance Notes: Pear, Juicy Mandarin, Orange Blossom, Peach Nectar, Apricot, Honeysuckle, Honey, Golden Vanilla, Smooth Woods. Have you tried Marc Jacobs fragrances? Do you have a favorite?